"God's Blessings Address Labels" product is already in your cart. These beautiful and encouraging God’s Blessings Address Labels offer inspirational messages for everyday living. With profound verses from the Bible accompanying gorgeous views of different landscapes you will enjoy the following: A serene view of a lake surrounded by trees with mountains in the background, majestic red rock peaks under a pretty cloudy sky, a spectacular sunset and a rocky shoreline. 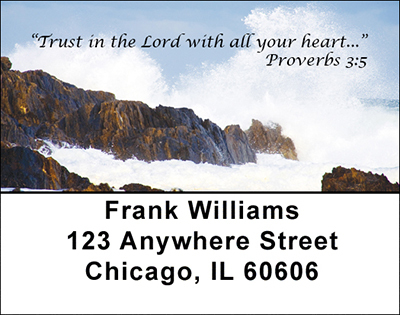 With these God’s Blessings Address Labels you will see the splendor of our beautiful country and the spiritual words of wisdom that will encourage everyone who receives these labels in a positive way to enjoy life to the fullest.